In his first book, mindbodygreen founder Jason Wachob redefines successful living and offers listeners a new life currency to build on - one that is steeped in well-being: Wellth. "Many of us aren't satisfied with just trying to accumulate the most money and toys. The good life is no longer just about the material; instead it can be found in a lifestyle that is devoted to mental, physical, and emotional health. A wellthy existence is one in which happiness is attainable, health is paramount, and daily living is about abundance. It's a life in which work is purposeful; friendships are deep and plentiful; and there's a daily sense of richness or overflowing joy. But since there's no one-size-fits all definition of a wellthy existence, I hope this book will serve as a guide to help you embark on your own personal journey that is both unique and meaningful." Eat. Move. Work. Believe. Explore. Breathe. Connect. Love. Heal. Thank. Ground. Live. Laugh. 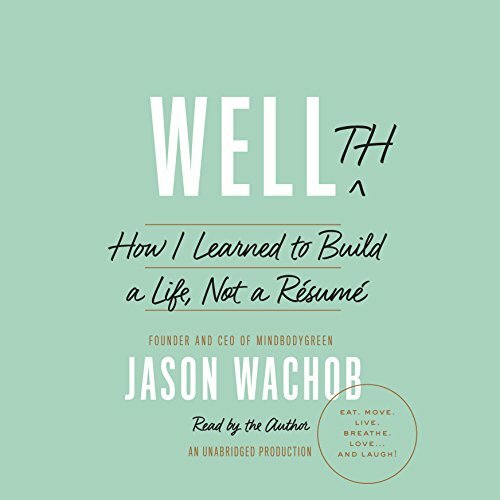 These are the building blocks of Wellth...and in this blend of memoir and prescriptive advice, Jason Wachob shows us all how to enjoy truly "wellthy" lives - lives that are deeply rich in every conceivable way. Through his experience and personal story, as well as in exclusive material from popular expert contributors (including Dr. Frank Lipman, Dr. Lissa Rankin, Joe Cross, Charlie Knoles, Kathryn Budig, Dr. Aviva Romm, and Dr. Sue Johnson), we learn how we, too, can embrace this new movement and develop richer, fuller, happier, healthier, and more meaningful lives. What will make your life more wellthy? Come and explore it.